The Oneida language is struggling to survive. Only a few dozen people grew up with it and still speak it fluently in Wisconsin, New York and Canada. UNESCO classifies the language as critically endangered. How it got to this point involves a complex entanglement of education policies and cultural loss dating back more than a century. But preservation efforts continue, and UWM School of Education master’s student Antonio Doxtator is deeply invested in helping. 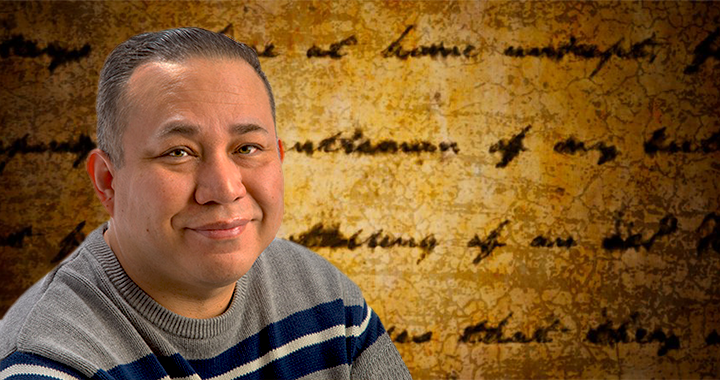 A member of the Oneida Nation of Wisconsin himself, Doxtator is studying how educators have revitalized efforts to pass their Oneida cultural heritage to younger generations, with an eye toward improving such efforts and ultimately saving the language. Doxtator interviewed three generations of Oneida language students to see how teaching has changed over the years. Doxtator took a complicated path to finding his research calling at UWM. It included dropping out of high school when he was in 10th grade. He eventually earned his high school equivalency certificate, then an associate degree in human services from MATC. After working as a gang task force coordinator on the Oneida Reservation west of Green Bay, he completed his undergraduate degree at UWM in community engagement and education. Now, advised by Associate Professor Marie Sandy, he’s pursuing a master’s degree in cultural foundations of community engagement and education. In doing so, Doxtator is also exploring the legacy of Native American boarding schools. The U.S. Bureau of Indian Affairs began operating off-reservation boarding schools in the 1870s with the goal of assimilating Native American children into white, English-speaking society. Children were taken from families, given English names and forbidden to speak tribal languages. Through his work, Doxtator aims to keep changing education from something that took away Native American culture to something that rejuvenates and preserves it. Originally appeared in UWM Research.